We co-design technologies with autistic children that are fun and meaningful in their lives. We let children guide us in this process instead of letting their perceived deficits determine the requirements. Working with children 6 to 8 years old, we conduct a series of individual workshops over the course of one school year to let them design their own smart object. In the past year, we developed several objects, including sound cubes, a personal alarm system, and an illuminated drawing table. Each of these objects tells a unique story about the life-worlds of children and the collaboration they engaged in. Frauenberger, C., Makhaeva, J., and Spiel, K. Blending methods: Developing participatory design sessions for autistic children. Proc. of the 16th International Conference on Interaction Design and Children. ACM, 2017. Spiel, K., Malinverni, L., Good, J., and Frauenberger, C. Participatory evaluation with autistic children. Proc. of the 2017 CHI Conference on Human Factors in Computing Systems. ACM, 2017. 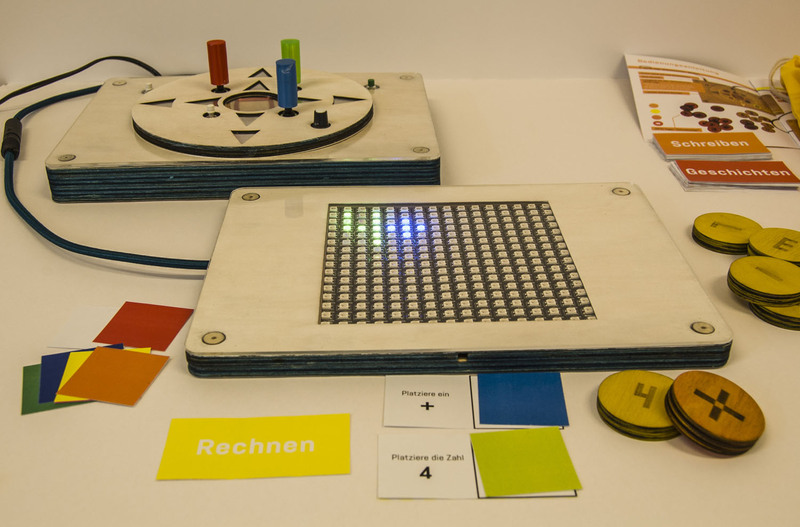 Öxe, a light table with different learning modes (here in math mode). Sound Cubes, messaging devices for a very small audience.